Arts and Crafts silver and furnishings are showcased in an early Illinois bungalow. An owener finds her home;s history still resonates. Chicago bungalow architecture has come into its own. A one-of-a-kind Streamline Moderne in Berwyn, Ill.
Renovating a brick bungalow on Chicago’s North Side. 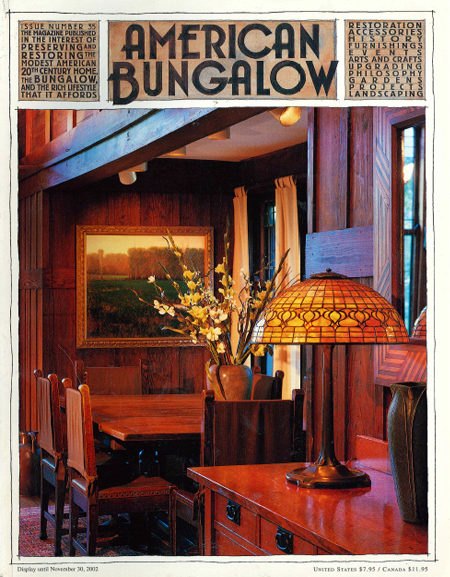 Bainbridge Island, Wash., and two exceptional bungalows. A so-so bungalow is transformed in Bend, Ore.
Old bungalow plans still work for today’s families. A furniture maker falls for Green and Green big time.